A Long bike ride in-between green mountains is always a thrilling adventure. Especially when we talk about a way that reaches to Laddakh at the end. All we need, a good mood and a nice bike to ride on. The summers of late August in Delhi and all I was thinking is to go someplace where I could feel some cold breeze and fresh environment. 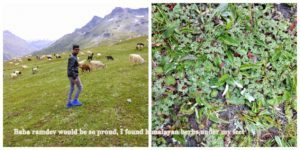 So I decided to visit Manali but I was still confused about going to Manali again and again without any novelty. 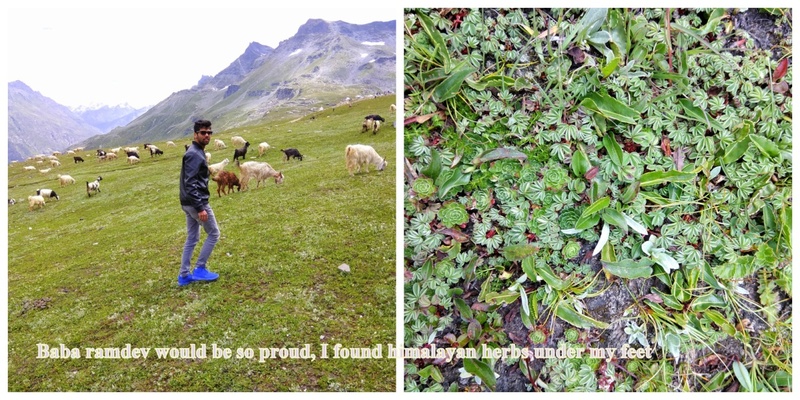 That’s when I decided to have a long bike ride from Manali to Keylong. Keylong is a small town full of simplicity and freshness that comes at the end of Himachal and on the way to Leh. I packed my bag, booked my ticket to Manali using redbus, it costed around Rs 1200/- and headed toward ISBT. When I boarded the bus, It was already 8:30 pm evening, as I was already full after dinner so I decided to sleep. The cozy environment due to AC of bus triggered it more. When I woke up my eyes were already witnessing the mountains from the window of the bus. After 17-18 hrs of long journey most of due to traffic jams after landslides otherwise it takes 14-15 hrs to reach there from Delhi, we reached a place called as Manali, a beautiful place somewhere among the sky touching green conifer trees. That can turn lovely sights into unforgettable moments. Since it was lunchtime already, we headed toward mall road main market and had lunch in a local restaurant. Then we directly moved toward bike shop and rented a Royal Enfield 350cc for two days and paid Rs 1000/- per day. As long as we booked a bike for next day and were planning to visit market it began to rain. Luckily, we already booked a hotel in free time after sleeping in the bus it costed us Rs 1000/- per day. 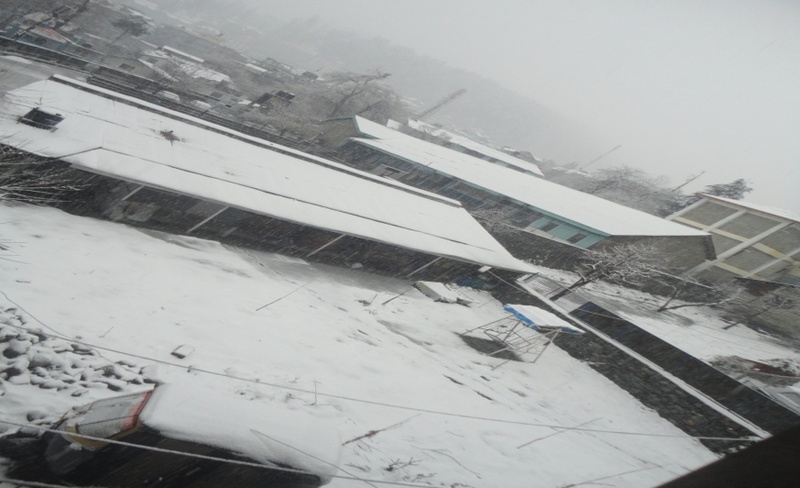 However, I feel if you visit Manali and you don’t want any luxuries hotel to stay, please directly visit the local hotels it can be real deal of nice place with best prices. 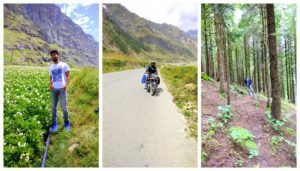 Next day, our permission to cross Rohtang pass was already prepared, the bike was ready to be handed over to us and we were ready and excited to feel the dazzling beauty and chill wind of the place simultaneously, Finally, we fueled our bike and our desire for the real roller coaster. As we started rising uphill the normal trees such as Apple began to disappear and cedar and deodar took their place. We reached at the end of the city and at the checkpoint where the permission to pass that was needed to show. 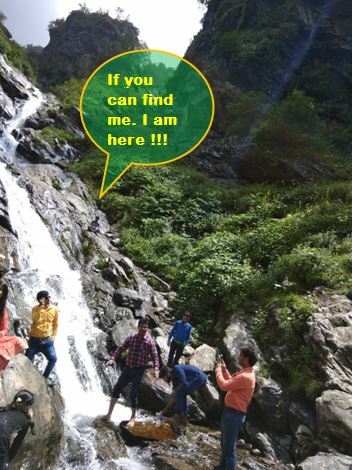 However, that could not stop us as we moved on we saw a mesmerizing waterfall side of the road the dazzling water was coming down to rocks beauty at the top. I put my bike on the stand and climbed to the fall to take some great click. As we moved down, we had few snacks from a shop downside and returned back to our conquest. Engine of Enfield was on again, and small one lane road and we were rising on the mountain we could see that. Whenever a truck used to come I had to take the bike to side test of skill level 1. The view from the bike is way different from going inside of any four-wheeler as you see everything ahead above and besides you, the feeling is thrilling and amazing. We kept going for 3 hrs from the beginning and wind kept getting cold we began our ride in T-shirt and now I had to wear my favorite leather jacket. At this height, the pressure was low and all pouches of snacks were now balloons and bursting in air. And then after 15 more min we were at the top. 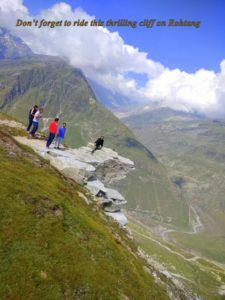 We could see the lots of four wheelers parked we knew we reached at the Rohtang pass, full of visitors in the summers. 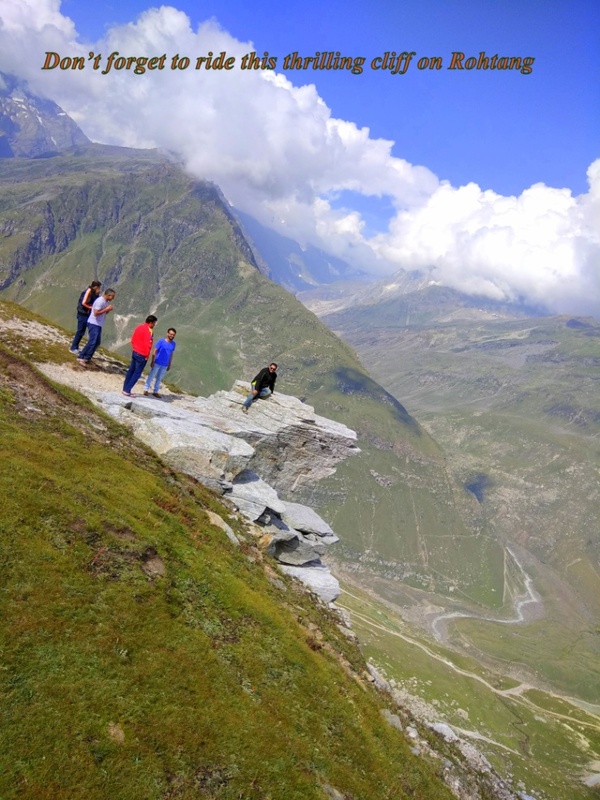 It is at height and chilling and please don’t forget to go on the cliff on side of Rohtang pass. Now the real test begins, people were returning from Rohtang so there was almost no traffic on the road, but as we were going downward to Keylong the road was completely abolished. Wheels of bike were somehow rolling on the slipping stones. I give full credit to the 350 Hp black beauty as I was holding it never felt that we will slip down to the mountains to the hell. Next 15 km from there road was completely broken until we reach a midpoint ‘Koksar’, where we had tasty Dhaba style chicken my jacket was full of dust face was dirty we took our time a got ready to ride our black horse again. This time we switched on engine and the time we crossed the bridge of the ChandraBhaga river it began to drizzle and our ride became more fascinating. We kept riding till we reach our point a small town called as Keylong. 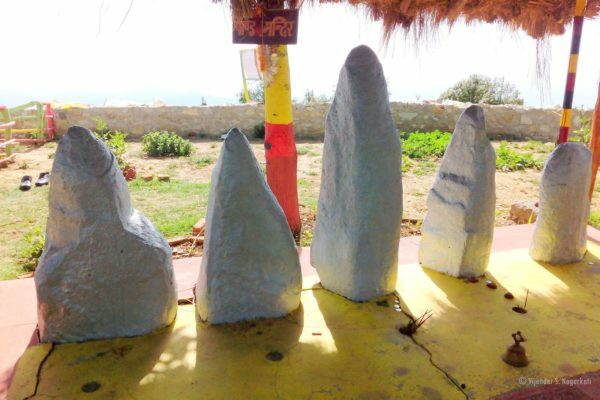 There was no internet and only airtel phone call signals were available “yes, the crazy airtel girl is absolutely wrong”. We found a nice cheap hotel 600 and it was almost the as same as the cost of approx 1100 per day. 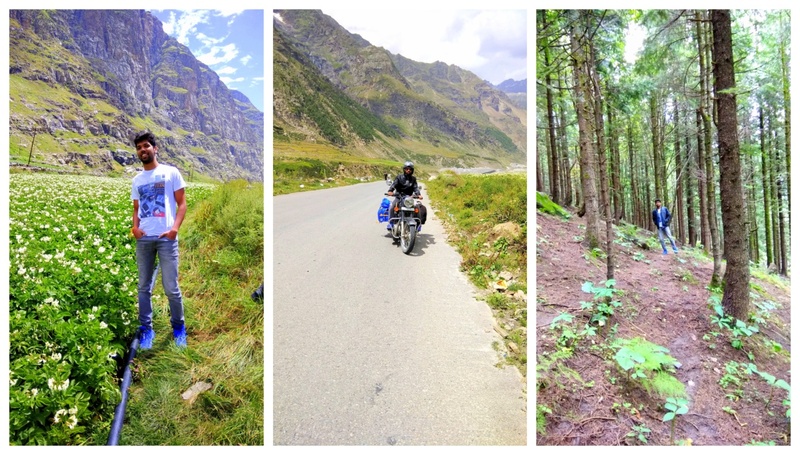 We stayed there for a night and next picked our bike again back to Manali.